Carla, knowing my love of old, obscure cookbooks, usually picks me up a bushel of cookbooks each year at the local $5 bag sale on the last day of the rummage sale. I found this one by chance, and it was a great way to use the ham and kidney I had on hand. 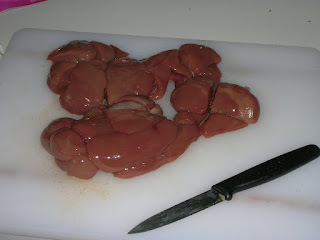 The combination of ham and kidneys was originally inspired by an old southern recipe to skewer the meats skish kebab-style before broiling or grilling. As shish kebabs are rather awkward to bring in to work for lunch, I decided to work on refining my empanada-making skills and transform this recipe into something a bit more portable. I split a calf's kidney in half and the stodgy white core of fat was sliced out. I browned the kidney quickly in a bit of olive oil, trying out a tip from another cookbook. This one indicated that cooking the kidney in fat, then discarding that fat would help to draw out any "acrid" flavors from the kidney. Frankly, I wondered if this was a remedy for dealing with any type of dodgy meat, but what's wrong with a bit of experimentation? The kidney was then braised in vegetable broth with onions and bay for about 3 hours at 325 F.
From here, the recipe was just mix and fill. I used white button mushrooms to help bulk out the mixture, after the mushrooms were sauteed with a good bit of tarragon. Diced ham with onions rounded out the filling, mixed in with a bit of the kidneys' braising liquid. To work with the full flavor of the kidneys and ham, my primary flavoring was about 4 tablespoons of prepared horseradish (not the cream sauce, just the shredded kind loosened with a bit of white vinegar). If you're not a person to glob horseradish on sausages like ketchup, feel free to use less. But what lunch could be simpler and more satisfying than ham on rye? With this in mind, I decided to make my empanada dough out of rye flour. 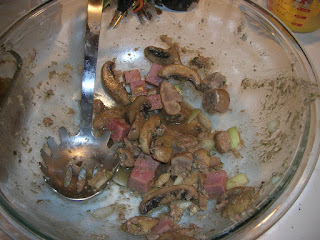 A bit denser, but wonderfully flavorful, and sure to stand up to all the bold flavors I was amalgamating into one dish. Brush with egg wash (with a dash more horseradish in it), these meat-filled pastries baked at 375 F for about 35 min. All in all, these were tasty, and did work flavor-wise to a certain extent. The problem with the empanada is that I would get one bite of kidney, another of ham, then a big bunch of mushrooms. I much prefer empanadas to be like a stew, where everything cooks together and become a flavorful whole, giving you a complete picture in each bite. I think the original recipe had it right to keep this as a shish kebab, so you could try the meats like a "mixed grill" dinner. A bit of ham, a bit of kidney, back and forth, however it suited you. To be honest, maybe I should have used a horseradish cream sauce to bind everything together a bit more. Ah well, next time!